Created by: Len Wein and Dave Cockrum. Skills and Abilities: Storm is very proficient in unarmed combat due to life on the streets and further training from Wolverine, Yukio (both Samurai) and Professor Xavier. She is also trained in armed combat being proficient in the use of knives and guns. Storm is also an exceptional thief able to pick any lock given time. As a thief she carries a set of lock picks at all times. Storm is also an expert strategist whose use of skills and strategy allow her to defeat far superior enemies such as Crimson Commando and Callisto. Storm is also noted as having a very strong and indomitable will which when added to her ability to release electricity from her body gives her a measure of immunity to telepaths. They have also noted it’s hard to track and maintain contact with her mind. Her will and magical potential also allowed her to host eternity, a feat which has never been accomplished with the user surviving before. 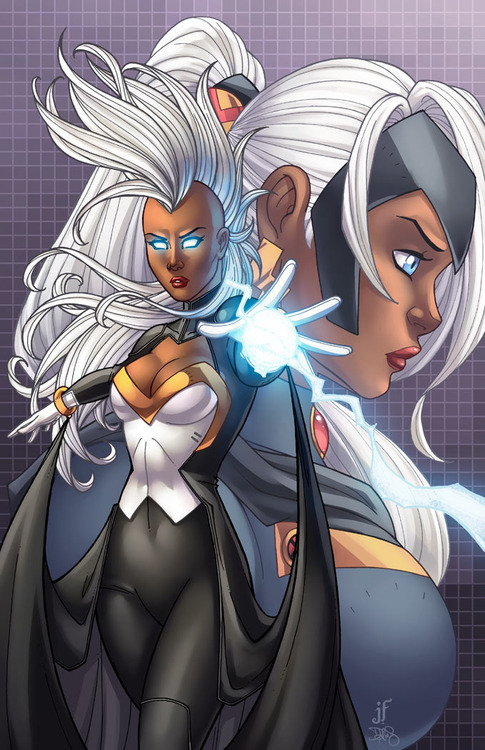 Potential: Storm is descended from a line of Kenyan magic users and sorcerer supreme; most notably Ashake; who have blue eyes and white hair. As a result she has strong magical potential though it is undeveloped. In the Magic Arcana series she is marked as potentially powerful as the Scarlet Witch and Agatha Harkness in magic. Ororo is descended from an ancient and powerful line of African magic users who get their distinctive features (white hair and blue eyes) every five generations. It’s theorized that their origins lay in the Great Rift Valley, where the human race is said to have originated. Years later Professor X recruits her into his team and she forms a strong friendship with Jean Grey/Pheonix and her fellow new x-men alum Wolverine, Colossus and Nightcrawler. She also plays the role of mentor and mother to Kitty Pryde/Shadowcat and reformed villain Rogue. Storm also took over leadership of the X-men in Cyclops absence (Uncanny X-men #139, November 1980). Adventures of the time included facing the evil space aliens the Brood, being bitten by Dracula and gaining leadership of the X-men from Callisto in single combat (Uncanny X-Men #169-170, 1983) . A relationship between herself and mutant Forge also develops. She led the X-men’s gold team at this point and had her relationship with forge ends when he thought she would refuse his proposal. Her failure as leader of the Morlocks also came back to haunt her as Marrow and Gene Nation tried to remake the massacre by killing a human for every dead morlock on the anniversary of the “Morlock Massacre”. The only way to end the conflict and save those captured was by ripping her heart out (Uncanny X-men #325, 1996). After “Operation zero tolerance” she lead a reformed X-men team without the help of Xavier, or Cyclops which included fellow African Maggott and Cecelia Reyes a doctor. She also faced the shadow king again. Storm discovered the diaries of destiny and didn’t trust Xavier with them so she formed her own team and traveled the world to find all of them. After saving the world multiple times they returned to the mansion as the official police force for mutants. After HOM she rekindled her romance with T’challa (Black Panther  #14) and the two wed (Black Panter  #18). Together they joined the Fantastic four briefly (Back Panther  #26) and she later joined the Astonishing X-men (Astonishing X-men #25) when T’challa became a financial backer. She remained at her husband’s side and battled the shadow king again with the help of Bast (X-men Words Apart 1-4). During Doomwar she was captured by Doom and later rescued (Doomwar 1-4). After the devastating after effects T’challa has decided to take over protection of Hell’s Kitchen and she understands (Black Panther: Man Without Fear #. They were then living apart and she has returned to active duty as an X-man leaving Wakandan in the hands of her Sister in law Shuri. Storm briefly joined the Avengers and went to Utopia with her fellow mutants. During Schism she was personally asked by Cyclops to remain on Utopia with him to keep him on the right path. Along with Magik, Psylocke, Emma Frost, Cyclops and Magneto they created the “Extinction Team” and saved the world numerous times. In the aftermath of AVX she joins the Jean Grey School for the Gifted as headmistress and rekindles her romance with Wolverine. (Wolverine and The X-men #24) Storm has also joined Psyclocke to co-lead the Uncanny X-force (Uncanny X-force  #1) and later creates an all female X-men team. To signify the change in her life she has returned to her Mohawk hairstyle and donned a new costume. Queen of Asgard(Earth 904) On this world Storm never regained her powers and was given a hammer by Loki which enabled her to ascend the Asgardian throne. As all mother of the realm she lead Asgard into an age of peace and prosperity as herself and the mutants who remained in Asgard became the rulers of many of their kingdoms. Bloodstorm (Earth 1298) In this world instead of recovering from being bitten by Dracula Storm died and was reborn as a vampire. She joined Alex Summers super team “The Six” where she fell in love with fellow Vampire Gambit. She maintained her 80′s style Mohawk in this world and was more feral. Amazon (Amalgam universe/Earth 9602) In this world combining the DC and Marvel universe Ororo washed up on Themyscria and was trained by the amazons while growing up with Diana princess of the Amazons. When it came time to send an emissary to man’s world she defeated Diana and became Wonder Woman of this world. StormPhoenix (Earth 9590) On this world Storm became host to the Phoenix force after her friends were all killed in a spacecraft. This event ad others caused her to take control of the world to ensure worldwide peace as she ended starvation, war and segregation. Also , while his Indy work was excellent- Sweet Tooth especially ( thoughtful and perceptive and engaging ) it was also a bit grim and morose over all , though there was a very satisfying happy ending . It’s an interesting conundrum. TPB’s sell but the only way a book can survive is through monthly sales…. Upon reflection I think you are right on in your assessment of the Storm comic .It seemed she spent most of her time going over old ground and cleaning up loose ends ( like she was getting ready to close up shop )She never really moved forward .